This design has been a long time coming, but it's finally available in Joie Studio's Etsy shop! It's no secret I'm from Honolulu...and here I am with yet another homage to my home state. I gave a sneek peak of this design in June, and I've finally gotten around to scoring them, folding them, and packing them into nice sets. Love the embossed effect on the hibiscus because of the debossing of the background stripe and then floral design - the leftover unprinted paper around the flower looks raised in comparison. I also printed 'mahalo' in orange and aqua. It was originally meant to have another color scheme entirely, but I really really love the mandarin orange / aqua blue color combination, so I thought I'd go with that instead. Mahalo for looking and I hope you enjoyed! Okay, that's it for my Unique OC recap. I really enjoyed being a part of a smaller crowd at Unique OC, and I hope the attendance skyrockets as Sonja and her Unique crew work out the kinks of the show. I hope you enjoyed seeing some of the vendors that I met and enjoyed! Happy Friday! Hope you've got great weekend plans! Our neighbors to the back of us at Unique OC was Paper Pastries, whose proprietor Margaret was super sweet. If you've ever wondered what the difference is between "stamping" and "letterpress," take a look at Margaret's cards and then take a look at Joie Studio's cards. Her cards are stamped. Ours are letterpressed. There is a definite difference in terms of technique, materials, ink, and outcome. Loved meeting you and your boyfriend Margaret! A hallmark feature of this collection, besides the three color nature of the design collection, is the blind impression of the background pattern in the back, which gives the cards a quilted appearance. Love it. All of the cards are up in Joie Studio's Etsy shop, and the cheery faces are available in a set of 4. Enjoy! I had the pleasure of meeting Laura (and her husband and dog) of Lulu Dee. It's always great to meet another letterpress printer, and I loved talking shop with Laura. My booth always seems so spartan next to these booth setups with props and such. But when you have so many cards and such to fit into a six year old Mazda 3...ah well...anyway, let me lust over the table setup a little bit with the vintage typewriter, chalkboard, phone, and desk accessories. Next up is Joie Studio's LUXE letterpress website. We've got a number of new designs coming up and it's going to be great! Anyway, if you want, take a look at www.joiestudio.com and let me know what you think! You know, when you sit at a booth all day, especially at one of these outdoor things, sometimes you talk to your neighbors a lot, and sometimes you don't at all. The guys at Detroit Sprinkles were super chill, and really super awesome guys to sit around with all day and shoot the breeze with. The more I saw people buy their tanks and tees, the more I wanted something...anything. But alas, I am saving for some letterpress machinery and supplies so I will have to pick up some sprinkley goodness another time. Thanks for keeping me company, Detroit Sprinkles! The rest of the week will be dedicated to recapping Unique OC and featuring some Unique OC vendors that I really enjoyed meeting. To my San Francisco friends and fans: I will be bringing an abbreviated version of this setup to the J-Pop Summit September 18th, so come visit! I printed these back in April. My own personal policy has been not to post invitations on blogs until AFTER the event has taken place (for obvious reasons), but by the time the event happens, I forget where I put my sample of the print run and then it's this whole big thing. 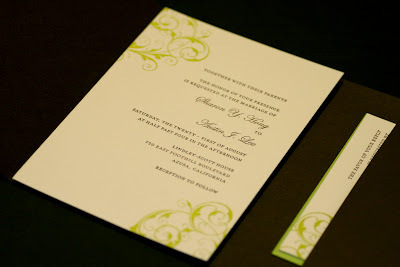 So I end up not photographing and blogging the majority of the invitations I design and print. But, I digress. These were printed on Reich Savoy, which I absolutely love. I remember quite vividly that I was very taken with the bride and groom. They were really great, level headed, and easy to work with. I especially love Austin's statement that he wanted letterpress because it is the most laborious of methods. So true, my friend. So true. Mr. Vandercook (above) and Ms. Pearl have been busy churning out letterpress invitations. The last custom letterpress invitations for events the weekend of October 9th and 10th have finally gone out, so I finally get a couple days not chained to the presses to clean my studio and catch up on blogging and computer work. This particular invite combines a number of hot invitation trends right now: DIY design, letterpress, silhouettes, navy blue, RSVP postcard, vintage stamps. Hot, hot, hot. I cannot wait for the wedding to happen so I can share the full invitation suite with you. I still have a number of custom jobs in queue to get through (as always!). I'm going to attempt to get some product photography of recent projects and new cards today or tomorrow so I can share new stuff with you. Website renovations are underway for Joie Studio's websites! I am now prepping for J-Pop Summit & LA Printers Fair next month. OMG. I cannot believe that tomorrow is Unique OC. I have been so wrapped up in some custom letterpress wedding invitation work that I've neglected the blog for almost a week. *Sigh* There is only one of me and many many things to do. $5 for the whole weekend! The award winning gourmet LA food trucks The Manila Machine and Sweet Lucie's Ice Cream will be in our cafe all weekend! AMOEBA will be joining us with a pop-up shop! Best of all, Joie Studio's got 10 guest passes to give away for the weekend if anyone wants to go. Email me for details -- first 10 gets them! 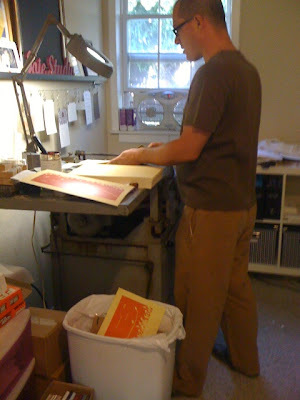 Ken (above) and Shino from Fugu Fugu Press came by my studio for some Vandercook loving on Tuesday. It was really nice to have them in the studio while I was working. For the first time ever, both the Pearl and the Vandy were being used at the same time. And Shino was nice enough to play with press puppy Romeo, who brought all of his frisbees to entice Shino to play. The above is a sneak peek of a wedding invitation suite we just finished. And it highlights a new addition to Joie Studio's repertoire. You have to have letterpress wedding invitations, and you want the rest of the suite to match. But you don't have enough in your budget to have every piece letterpress printed. What to do? A new exciting thing that we've been doing to make things more affordable is flat printing onto letterpress paper. Yes, that's right. Flat printing. Flat printing on to thick, luxurious, soft and fluffy 100% cotton letterpress paper. Mind you, I have never before advocated flat printing. I am a letterpress printer, after all. And I really disliked the way the flat response card never quite matched with its super thin cardstock. But with Reich Savoy, we've been able to give our clients beautiful flat printed response cards on the same paper that we letterpress on. Being able to use the same paper for invitation and response card across multiple printing processes gives the invitation suite an overall cohesiveness. And what I do to account for color variations between flat printing and letterpress printing is I do the flat printing first and then match the ink colors to the flat printed items, so my clients get a uniformity in color and paper. The invitation is letterpress printed. And the response card is flat printed. I think it's a wonderful way to keep uniformity amid different printing processes. So, if you can't afford to have your whole invitation suite letterpress printed, we now have what I believe to be a really good option to help you be able to afford some of the suite to be letterpress printed and some not and still look amazing and luxe. Hybrid and flat printing are only available at the moment on Reich Savoy 118lb Bright White (we're still working on natural white). Contact us for more information! Poor Honey Bunny has been sitting around, unboxed at the bottom of one of my moving boxes (yes, the studio is still not quite 100% unpacked). So I took pity on him and boxed him up! He is the first of Joie Studio's second collaboration with our friends at SHOP TOAST. This design is letterpress flat stationery (A2 in size) printed in 4 (yes, four!) handcrafted ink colors. My friends at SHOP TOAST like to make me work hard at their designs. Honey Bunny is available in Joie Studio's Etsy shop! Sometimes just a little bit of ribbon adds so much to the packaging (that, and it keeps the cards from rolling about everywhere in that box, too!). Unique OC in less than 2 weeks! 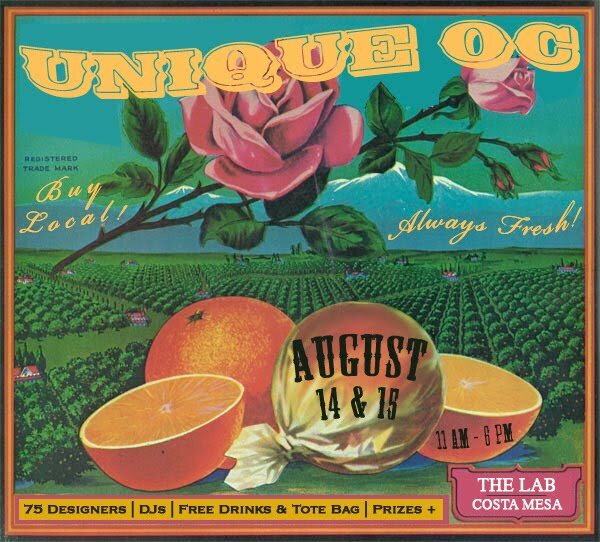 Okay, so last Friday I went to the vendor meeting for the upcoming Unique OC at The Lab, put on by the same awesome organizers who put on Unique LA, and I have to say that they are going to bring the same awesome radness to Orange County in less than 2 weeks! 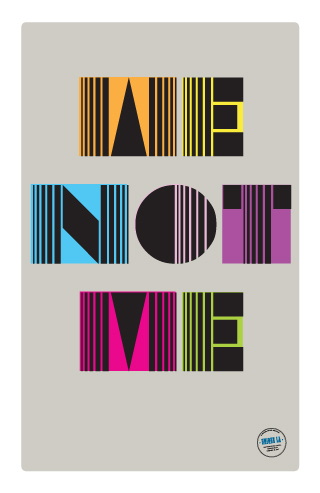 I will be there, along with a bunch of brand spankin' new letterpress designs (the ink is barely dry on some of them). Also, if there are any brides out there who would like a consultation with me, I am happy to block out some time to talk to you about your wedding. Just email me and we will set aside some time for you. Hopefully I will see you there August 14th and/or 15th!